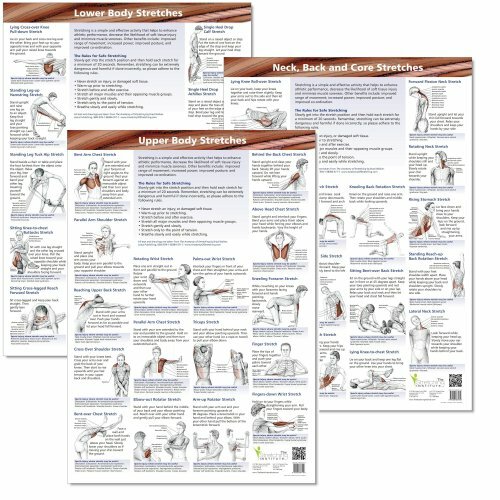 Using drawings taken from the best-selling Anatomy of Stretching, these beautifully illustrated wall charts (Set of 3) shows exactly what is happening during a stretch. Each of the 16 key stretches (on each chart) illustrates the primary and secondary muscles worked, showing how to perform each stretch and highlighting sports injuries for which each stretch will be beneficial. Aimed at fitness professionals, physical therapists, sports scientists, or anyone involved in sport, these charts will help explain what is happening during a stretch, how the stretch can assist in recovery from injury, and add color to any gym or treatment room wall. Each chart is a huge 2ft x 3ft size (23.4 x 33.1 inches or 594mm x 841mm), printed on high quality 170gsm gloss art paper. Each chart contains vital stretching information on why you need to stretch, how to stretch properly and a set of rules and guidelines to help you get the most out of your stretching. Plus a full description of how to perform the stretch; a detailed list of all the muscles involved; and a list of sports injuries that the stretch will help with. View More In Fitness Planners. If you have any questions about this product by The Stretching Institute, contact us by completing and submitting the form below. If you are looking for a specif part number, please include it with your message.